For the convenience of a ski-in/ski-out hotel right at the Squaw Valley ski resort, it’s hard to get any better than the Resort at Squaw Creek. 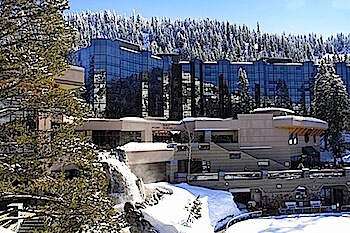 Much more than a convenient place to access both Squaw Valley and Alpine Meadows (which requires only one lift ticket), the luxury resort is also a sweet spot to relax when you’re off the mountain. The hotel’s 405 guest rooms range from deluxe rooms to fireside suites to bi-level penthouses. All rooms have at least a full bath, LCD flat-screen TV, robes, hair dryer, coffee maker and refrigerator. Suites and penthouse rooms have resort kitchens and gas fireplaces. 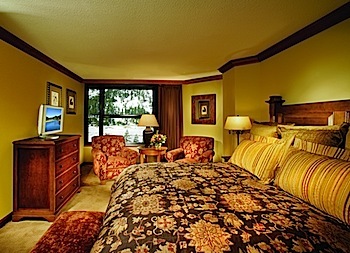 Rates at the hotel start at $229 per night, and vary depending on type of room and time of year. 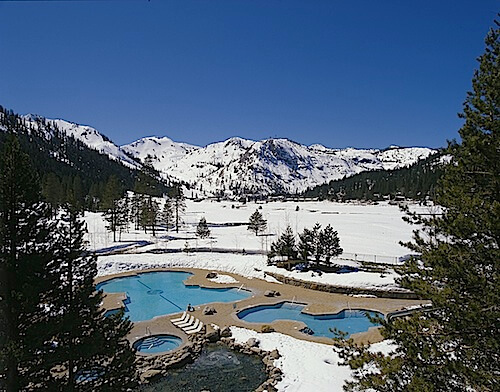 In winter, take advantage of the hotel’s placement at Squaw Valley: ski-in/ski-out accommodations and a private chair lift. The resort’s Nordic Center will set you up with ski and board rentals, plus sells the gear you may have forgotten at home, or that ski outfit you’re eyeing for an upgrade. Taking a break from skiing? Go for a spin on the ice-skating rink or have a soak in one of the hot tubs. My eye may be on the ski slopes at the moment, but that doesn’t mean the Resort at Squaw Creek is limited to a winter-only venue. Summer activities include hiking, biking, horseback riding, tennis, golf, fishing, boating, kayaking, swimming and rafting. Take advantage of the wealth of outdoor adventures that Lake Tahoe offers and visit in both summer and winter to get the best of both seasons. When you’re hungry, swing by any of the handful of dining options on property: Six Peaks Grille, Sandy’s Pub, Sweet Potatoes Deli (my favorite for breakfast), Mountain Pizzeria, or The Oasis. Work out your sore ski muscles in the hot tub or at the resort’s spa. The hot stone massage was enough to get me to bounce back and hit the slopes another day. See more at the official website for the Resort at Squaw Creek. You can also book online at Hotels.com or Priceline. Article by Jill K. Robinson of Danger Jill Robinson. Photos courtesy of the Resort at Squaw Creek. I was a guest of the Resort at Squaw Creek during my stay.